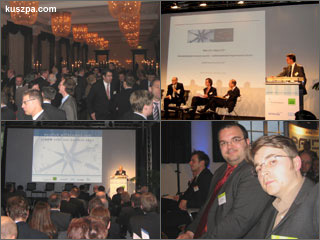 I went together with Marcus to the e|NRW Internet Summit in the glamourous Grandhotel Schloss Bensberg. We were primary interested in the panel „Web 2.0 equal Hype 2.0?“. Dr. Martin Fabel from A.T.Kearney gave the audience a thrilling outlook on the valuation of companies like MySpace, YouTube, Google, Xing and StudiVZ. Guillermo Bänsch from Quelle spoke about User 2.0 and Crowdsourcing, but to be honest, on that evening I didn’t hear anything really new and exciting about Web 2.0.
ones again, how things can be different when U put them in a relation to your skills and knowledge. Just succeeded with bringing Internet back to my computer. This was something new and very exciting for me. Give my greetings to Marcus.